More than a dozen men disappeared without a trace during Russia's annexation of Crimea. Their families are still waiting for news — and justice. 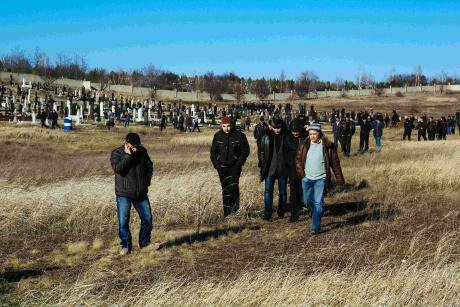 March 2014: Crimean Tatar community mourns death of tortured activist Reshat Ametov. (c) Yaghobzadeh Rafael/ABACA/PA Images. All rights reserved.We stopped for petrol on our way to Belogorsk, a small town in Crimea. I was there in October with a colleague, researching human rights issues. Brand new yellow signs inside the petrol station were in Russian, Crimean Tatar and English. Some government buildings in Simferopol, Crimea’s capital, also have signs in Crimean Tatar. They are clearly meant to project a message that the Crimean Tatar language, culture and heritage are protected and preserved. However, Crimean Tatars we spoke to during our visit, face a completely different — and a much less hopeful — reality. In Belogorsk, we visited Abdureshit Dzhepparov, who for decades has been an outspoken activist on Crimean Tatar issues. I first met and interviewed Dzhepparov in September 2014, when his son and nephew became victims during a wave of enforced disappearances of Crimean Tatars and activists in Crimea. Sitting on the floor in his drafty house, amid an unfinished and abandoned renovation, Dzhepparov told me that his son, Islyam Dzhepparov, 18, and his nephew, Dzhevdet Islyamov, 23, were last seen walking along a road near Belogorsk just a few days earlier. A witness saw a minivan with tinted windows stopping next to the two young men. Two men in black uniforms got out, frisked them, forced them into the minivan and drove off. The witness told Dzhepparov that the men had been “fast and professional”. Crimean Tatars are a Muslim ethnic minority indigenous to the Crimean Peninsula. In 1944, Soviet authorities accused the entire Crimean Tatar population of collaborating with the Nazis and, as collective punishment, deported all Crimean Tatars, estimated to have been 240,000 people, to distant regions of the Soviet Union. More than half reportedly died in the following months from starvation and disease. They were allowed to return to Crimea in the mid-1980s, and have openly opposed the Russian takeover there. At the time when Dzhepparov’s son and nephew disappeared, Crimea was six months into Russia’s occupation. Russia was swiftly imposing its own laws on the peninsula. The pressure on Crimean Tatars was steadily rising. Dozens of armed masked men were searching Crimean Tatar homes, mosques, and Islamic schools, looking for “weapons and extremist literature”. Crimean Tatar media outlets were being gradually pushed off Crimean airwaves. Pro-Ukraine activists, journalists and Crimean Tatars were either leaving the peninsula or seriously considering it. Armed paramilitary groups, which emerged in late February 2014 to prevent any opposition to Russia’s takeover, threatened and viciously attacked critics with complete impunity, and were also implicated in several enforced disappearances. Timur Shaimardanov, disappeared on May 26, 2014. (c) Private. That included the 2014 disappearance of Timur Shaimardanov, a 34-year-old pro-Ukraine activist. One May morning, he left his house in Simferopol, after telling his wife he was going to the bank and would then pick up their eight-year-old son from school. He never came back. Just a few days later, Seiran Zinedinov, a 33-year-old Crimean Tatar activist and father of three who was looking into the disappearance of Shaimardanov, told his wife that he needed to step outside for a minute, then left the house without his wallet, passport, or driver’s license. Half an hour later, he called his wife, told her that he was walking home and asked her to start dinner. Neither Zinedinov no Shaimardanov were seen again. Shaimardanov’s family reported his disappearance to the police right away, but the criminal investigation was not opened until July. One of the investigators asked Shaimardanov’s relatives if Shaimardanov knew how to shoot a gun and then implied that he probably went to join the fighting in eastern Ukraine. In October 2014, two young Crimean Tatar men disappeared on their way to work. The body of one of them, 25-year-old Edem Asanov, was found hanged in an abandoned building in the resort town of Evpatoria. Circumstances surrounding his death are unclear. The other, Eskender Apselyamov, 23, never arrived at work and was never heard from again. Crimean Tatar activist Reshat Ametov disappeared in March 2014. Ametov’s body, bearing signs of torture, was found two weeks later. Armed paramilitary groups that were running the peninsula at the time were implicated, but the investigation didn’t bring any results. Abdureshit Dzhepparov was devastated by what happened to his son and to others, by what was happening to his home. Like other Crimean Tatar activists I’d met, Dzhepparov said he believed in peaceful resistance. While Crimean Tatar activists were refusing on principle to have dealings of any kind with the occupying authorities, Dzhepparov hoped that entering a dialogue with the authorities, illegitimate though he believes them to be, could help bring his son home, and other people’s sons and fathers. Dzhepparov set up a small group of several relatives of the disappeared men, as well as lawyers and activists, to regularly communicate with the local officials on the progress of the investigations. When we met in October 2017, the repairs to his house had been finished, but the disappearance of his son and nephew remained an open wound. Dzhepparov told me that not only has the dialogue with the authorities failed completely, but that things have gone from bad to worse. Zero progress has been made in investigating any of the 2014 disappearances. Ametov’s murder remains unresolved. In the meantime, more men have been reported missing and Russian authorities’ pressure on Crimean Tatars continues to intensify. Since 2015, authorities have opened 26 criminal investigations of Crimean Tatars on by all accounts groundless terrorism and extremism charges and have jailed dozens of Crimean Tatar men, taking them from their families, without credible evidence or basic due process. They are being arrested on charges of participating in or organizing a terrorist group, solely for acts — often in private — of expression, assembly, opinion or religious and political belief. The Russian authorities appear to be on a mission to discredit and vilify politically active Crimean Tatars. Among them is Emir-Usein Kuku, an active member of the group Dzhepparov founded to raise disappearances cases with the authorities. Authorities briefly detained him twice in 2015, repeatedly attempted to recruit him as an informant, and finally arrested him in February 2016 on terror-related charges. Six months later, the prosecutor’s office launched an investigation alleging that Kuku was neglecting his parental duties while in detention. When we were saying goodbye to Dzhepparov, he repeated the same bitter, melancholic phrase that I’d recently heard from several others in Crimea: because of Russia’s actions in Crimea, 100 Crimean Tatar kids have lost their fathers – some disappeared, at least one murdered, and others jailed on trumped up charges.